When FSU Assistant Professor of Mathematics Kate Petersen was growing up in Philadelphia, she had no idea that a career in mathematics was in her future. Her parents, an engineer and a nurse, couldn't have predicted it either. Even when she went away to Oberlin College in Ohio for her undergraduate education, math wasn't really on her radar. "I went to college as an undecided major," she says, "and I guess at some point I was thinking about majoring in science of some sort and I just kept taking math classes out of curiosity and I was informed that this wasn't normal behavior." That curiosity continued to grow the more Petersen immersed herself in math courses, and it wasn't long before her college friends started to notice and decided to clue her in to what was obvious to everyone else. "They did an intervention," she recalls. "[They said,] 'We hate to break it to you, but you might be a math major.'" That diagnosis turned out to be accurate, but even after Petersen finished at Oberlin she was unsure how to proceed. She took a year off from school after graduation while she gave the possibility of graduate school some serious thought. While that year didn't exactly illuminate her life's path right away, it did convince her that further study in math was worth a try. "I figured, you know, why not? I was curious about it. I wasn’t convinced that I wanted to go the academic route, but I didn't really feel like having a proper day job." She made her way to the University of Texas, and in doing so had to transition from the small, close-knit academic community of Oberlin to one of the largest campuses in the United States. "The math faculty [at Oberlin] was around ten people, maybe even less. Everybody knew everyone else; there were no grad students. The faculty knew every major's name. I played tennis with my faculty advisor every week." The contrast when she arrived in Austin couldn't have been starker. "I believe the freshman dorm has its own zip code," she says. "There were hundreds and hundreds of grad students, so that was a bit of a culture shock." That shock may have been an intimidating factor at first, but it taught her a few things about navigating a different kind of department. In time, she found that seeking out likeminded students within her sub-discipline was helpful, not only in providing a sense of community but in focusing her own interests. Her arrival at Texas also spurred her on toward a new seriousness about her studies, supplanting the cavalier curiosity that brought her to grad school in the first place. The complexities of three-dimensional shapes grabbed her interest, and she found herself fascinated with topology and number theory. "In two dimensions," she explains, "you can think of a sphere, the surface of a ball, the surface of a donut, the surface of a two-hole donut - but it really doesn't get that much racier than taking a donut with lots of holes and looking at the surface... In three dimensions, it's much more complicated, and it turns out that there's a way to decompose something that's three dimensional into little pieces and it turns out that most of these pieces are hyperbolic." That discovery led her to focus on hyperbolic geometry, an field of study that she continues to work in even today. 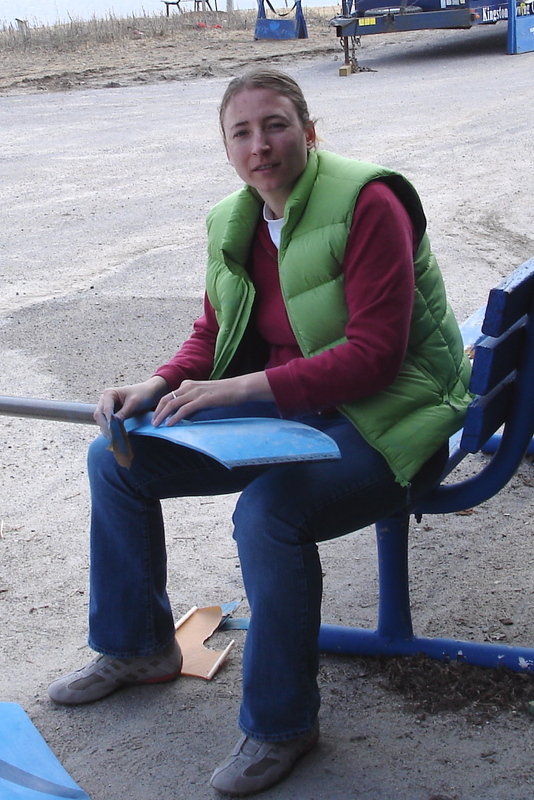 After Petersen finished her Ph.D. she moved to Queens University in Ontario, Canada, for a postdoctoral fellowship to continue her work on topology. The switch to the Canadian education system as well as the unfamiliar world of the postdoc were initially sources of concern for her, but Queens actually turned out to be more of a return to familiarity than she could have guessed. "Most of the Canadian schools are relatively smaller, you know. There are less people in Canada." The shift back to a smaller department was a positive change, and her experience with the welcoming, friendly atmosphere at Queens was a full rebuttal of her fears about the postdoc. Her work at Queens led to a one-semester fellowship at the Fields Institute in Toronto, and then, in January 2009, Petersen was headed south once again. This time, she was on her way to her first faculty appointment as Assistant Professor of Mathematics at Florida State. Since her arrival at FSU, Petersen has continued the work she began years ago as a graduate student at Texas. "Recently, I've been looking at these things called character varieties." That study allows her the opportunity to combine topology to her other chief interest, number theory, by trying to represent complex hyberbolic shapes with equations. The work provides her with a chance to make new discoveries about those shapes, as well as a serious challenge. "The hope is that those equations can tell you things about the original thing you started off with. The problem is that this process of going from a picture to the equations is actually hard." The payoff, fortunately, is as big as the work is difficult. When complex shapes can be broken down into x's and y's, those hard-to-conceptualize shapes begin to make more sense. Petersen has found, in FSU's math department, a friendly and supportive community of scholars, as well as the chance to work with young students in the same position she was in back in her days at Oberlin. She can often spot students whose probing interest in math may lead them down the same path. "There are some people that are really just curious about what's going on... They don't need to understand [the subject matter] this deeply to get the right answer." That same curiosity was what led Petersen into a lifelong academic pursuit and, coincidentally, to Florida State. With her own interests well stabilized, she just hopes now that she can finally find some consistency in her climate. "I moved from Texas to Canada, and then I moved from Canada to Florida, and I grew up in the northeast... I have a closet full of sweaters that I never use."